The exhibition stems from a project aimed at reconstructing a stage of female emancipation, their access to higher education, allowed in Italy only starting from 1875 as a result of a new university regulation that for the first time explicitly allowed women to attend the courses. 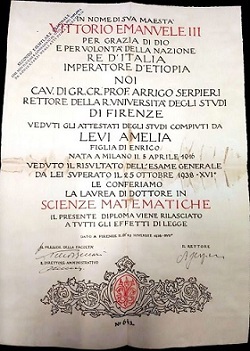 This was done through the patrimony of historical theses preserved in the Biomedical, Science and Humanities Libraries of the University of Florence, heirs of the libraries of the three sections in which the Higher Institute of Vocational and Advanced Studies, established in 1859 by the Provisional Government of Tuscany and transformed into a university in 1924, was organised. At the end of the nineteenth century, 14 women graduated in Florence out of the 237 throughout Italy and, on the threshold of the Second World War, female graduates in Florence were just over a thousand or 20% of total graduates. Today the situation seems almost overturned - in the calendar year 2017 the women were 4,965 out of a total of 8,263 - but the "glass ceiling" that effectively prevents women from reaching the most prestigious positions after graduation still exists. The theses of the first women graduates in Florence have been catalogued online, digitized and published online (with full text, where possible). The exhibition, which will be hosted in the premises of the Humanities Library from 14 December 2018 to 8 March 2019, shows the originals of a selection of theses, documents of great interest for the history of the institution and for the history of women's emancipation, accompanied by the corresponding publication or by other published works by the same author, archive documentation on their school career, photographs and biographical notes.